I keep seeing this problem on Facebook, and others like it. I can’t help it – every time it appears on my “wall” I have to glance at the comments and weigh in, taking the opportunity to teach a mini lesson in my own comment… now, I am not a statistician, but my eyeballs tell me at least 75% of folks that contribute an answer on Facebook are wrong. Thoughts? Is it the number choice? The operations? Do people have something against Aunt Sally? 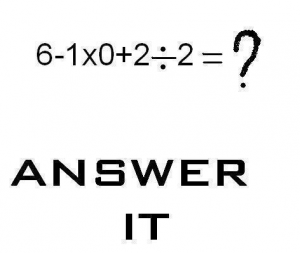 This entry was posted in Algebra 1, Pre-Algebra and tagged Facebook. Bookmark the permalink.